15 minutes play...BumbleBeans Inc.: Karin's piece is growing! I have only sewed on the tiny red border, and then I decided some sort of checked stuff would be interesting and started making some of that, and then I started burrowing through the block bits. Make your parts, Make your made fabric pieces, then start playing with you arrangements. 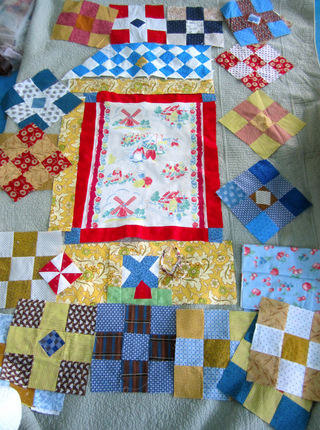 I can see how this will be a fabulous multi layered exciting quilt! I love your color choices - this is going to be a happy quilt! Looks great - love the colours and the eclectic collection of blocks. Your little windmill is the best part! It's so fun!! I think you've got the right colors and shapes going. Don't give up, it's going to be great. I love how cheery this is! Can't wait to see where it takes you. This is going to be great and I LOVE your windmill! !